To blend exceptional protection without gaining weight, E-Line makes their Carbon Fiber Pipe Guards from a blend of fiberglass, Kevlar, and carbon fiber materials bound together with hi-temp resins. The guards only weigh between 9 and 20 ounces but have a 75% greater tensile strength than aluminum. That makes for a massive amount of protection from impacts, abrasions, and piercing. Perfect for dual sport and enduro riders that can’t resist logs, rocks, or obstacles. In fact, Honda, Factory Connection, Yamaha, and KTM race teams all run E-Line Carbon Fiber Pipe Guards because they strike such a good balance between weight and toughness. Great fit and plenty of protection! Lightweight too! I did the hook method and still pretty easy install. This thing looks great and the fitment was spot on for my stock pipe. The fit is a little "funky" on 2011 YZ250 FMF gnarly pipe, but once on it works really good, no vibrations, stays put, saves pipe! It has saved my pipe a couple times. I now put them on everything. 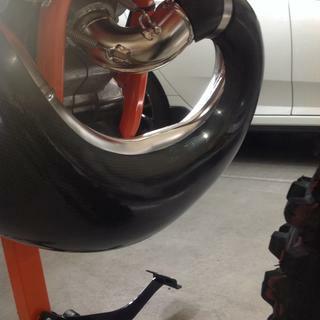 did not quite fit my fmf fatty pipe 2006 KTM 250 XC. had to do a bit of trimming with a dremmel and cut wheel. Still not perfect but better than the metal one size fits all type. Pipe guard works well, but doesn’t fit my fmf gnarly the way I expected it too. Has a few annoying gaps but it works! A little pricey, but it can take a hit! I debated purchasing this exhaust guard for about a year, because it's kind of pricey. Running hare scrambles, I have a fair amount of opportunities to ding my expansion pipe. One Pro-Circuit pipe, and a couple dings in my new FMF "Gnarly" pipe later, I figured I'd give it a shot. This guard is HEAVY DUTY! It's not just a decorative piece of thin / flimsy carbon fiber. It's thick, and meant to seriously protect your pipe. With racing season over for now, I've been playing on the ice lately, and had a fairly hard lay-down. Not a scratch on the guard, and no dings in the pipe! Worth the money vs. the cheaper aluminum guards! Fits awesome, has kept my pipe nice and undented! And also looks awesome!! Fits nice and was easy to install. I have multiple friends that have them and they protect the pipe from a lot of small dings and dents very well. A little pricey but definitely cheaper than a new pipe. Very durable have had it for a year and never a problem as long as you take care of it. Fits perfect on the PC pipe, already a few scratches but that is the idea. Looks awsome. Fits like a glove, no hassle installation. THe guard fits well and looks nice. One time down and the finish is scuffed off of course but what can you expect.... It does its job and protects the pipe well from rocks getting kicked up off the front tire but it is no match for dropping the bike on a rock. Fits the FMF Fatty pipe perfectly, but but beware. The description gives option of only "FMF" and does not differentiate between Gnarly and Fatty. In my experience it will not fit the Gnarly, but hugs the Fatty like a glove! Holding up well after dropping it a bunch. This feels like a strong product. Fit up was as good as you could expect from carbon fiber. <br>Pipe guard was packed full of mud after first ride. Applied another clamp at the lowest point of the guard hopefully this does the trick. This fit my FMF Fatty pipe perfectly and provides excellent protection from roots, rocks, and all sorts of objects. Bought this for a bike that had an fmf Gnarly pipe. Never did fit just right. There were gaps that I could not get to close between the pipe and the guard. I put it on and removed it about 15 times trying to get it to fit just right. It never did. Mud, dirt, and rocks would get between the guard and the pipe and I had to make sure to get all of that cleaned out after every ride. For the cost, I think the fit should have been better. The protection is pretty good. However, this thing kind of melted on my pipe. Definitely not a true carbon fiber product. I like the lack of rattling on the pipe compared to metal protectors so I'd buy again. Mine is about worn out from running over rocks and roots. Got about 2 years good use out of it. Pipe Guard looks nice, hopefully stays that way! The e-line pipe guard fits well, looks good, and should provide good protection - we will see how long it lasts - hopefully a long time. Works great, looks great, and will keep your expensive pipe from getting trashed. Very easy to install and fitment was perfect. Has taken many hits and no dings in my pipe. I have taken a couple good spills even did the stupid drop, and it saved my pipe. I have taken a couple good spills even did the stupid drop and it saved my pipe. left big gaps for mud to get in! used on fmf fatty. I installed this as soon as I bough the bike last fall. I have an FMF gnarly that doesn't have any dents or dings. The pipe protector is lightweight and almost bulletproof. 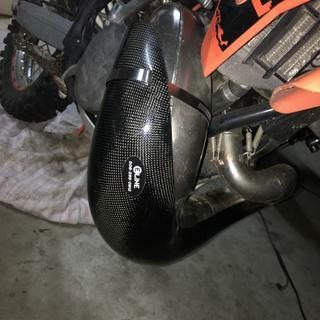 I was worried it might transfer big hits to the flange on the cylinder so I also installed a trail tech flange protector and after 50 hours over the past 9 months of aggressive trail rides and desert racing the protector looks great and my pipe is undamaged. It's looking a bit beat up but my pipe isn't bent. Even went down on the pavement in a GP race. Fits perfect and no damage to the pipe after a year of use. This guard looks the best. Everyone will know you love you bike if you have it on. The black looks awesome. It also protects the pipe fairly well, but not as well as the ugly old aluminum guards. This guard is better for front impacts from rocks skipping up, than for coming down hard on a log or ledge, because it protects the front of the pipe, not the bottom. Mostly I think they look really cool! I bought this for my 2014 husqvarna TC 250 and it fits perfect. Haven't bashed into anything yet. Fit the shape of my FMF Fatty well, had to do some minor mods but nothing extensive. Looks sweet. Very strong and looks awesome on the bike! 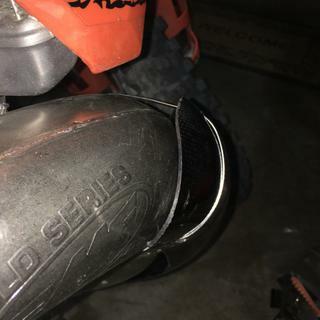 After 1 season of riding and harescrambling, it is still protecting the pipe but there is 1 moderate sized dent under a cracked spot that an aluminum guard might have done a better job. Otherwise, no rattles or maintenance required. I am glad I have it vs going without as I know I have scraped it up many times on rocks that would have crushed the bare pipe! This pipe guard is fairly affective. However, it stinks like the epoxy never cured. It's held up to some pretty heavy abuse, but I don't hit my pipe very often. I purchased this guard for my new 2013 KTM 250 XCW. It said it fits both stock and FMF Gnarly pipe. It fits great on the Gnarly but would not fit on the stock pipe. The guard looks great and is well constructed. The pipe guard fits well, but not perfect. The curve is such that it forces the pipe guard on the small end to sit on top of the welds which pushes the pipe guard away from the pipe a bit. Not a huge deal...but not perfect...so, 4 stars. If the guard was curved different or 1/4 inch removed from the small end, it would have been perfect. I am running this on the factory pipe. 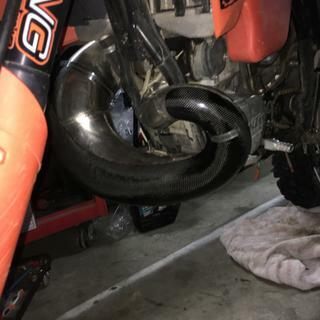 I've ran this E-Line pipe guard on my KTM 300 for the past 3 months. Installed and fit perfectly and it looked great. Lighter than aluminum. However, it's cracking near the band clamps and took a hit on one side breaking all the fibers. Am now patching it together with epoxy. It may only last 2 seasons whereas the aluminum versions won't die. The carbon fiber pipe guard is a must have. If I read the description right if I buy a new FMF pipe Part #1087110038 for my 2010 KTM 250 then this pipe guard won't fit? When will you start stocking the correct size? BEST ANSWER: Basically, if your FMF pipe was manufactured before November of 2013, this pipe guard #1315800003 will work with it. If your FMF pipe was manufactured after November of 2013 you'll need to order the newer version part #1315800004 which will fit the 2011-2014 250's. So if you order a new FMF pipe you also want to order part #1315800004 to fit that new pipe. So if I wanted to order part #1315800004 I have to select a 2013 KTM 250 SX even its for my FMF 2010 pipe? If I say its for my 2010 KTM I have no more option and end up with #1315800003 as only available selection. You'll have to put in a 2011-2014 KTM 250SX to get that part number for the newer pipe guard. But then it will fit the new pipe you order. I have a 2009 250 XCW....will the 2011-2014 pipe (the pipe that will fit this pipe guard) fit on the 2009 bike then? No, that pipe would not fit on your bike. It would need to be specific. The pipes for a 2009 model only fit from 2008-2010. 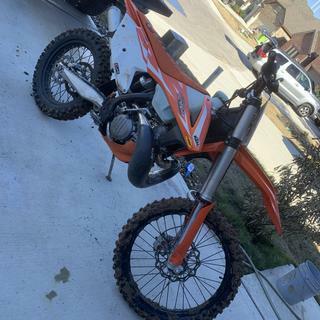 I have a 2016 KTM 300xc. Will this pipe guard fit the FMF fatty or gnarley or both? My 300 has the stock pipe, but my understanding is that this pipe quard will fit both FMF pipes. I used the same brand pipe guard on my sons 2009 200XC which has an FMF Gnarly pipe and it fit fine. It fits my 2016 KTM 250XC stock pipe, it also fits the FMF fatty i put on it. I can't speak towards the Fatty but I have the gnarled and it fits flawlessly. It fit my 250 xc with the fatty i needed to do a bit of trimming though. Will it fit my pro circuit works pipe? Probably not. This Guard is cast directly off the stock pipe, which it fits perfectly. I'm Guessing Pro circuit Works pipe is slightly different in shape. 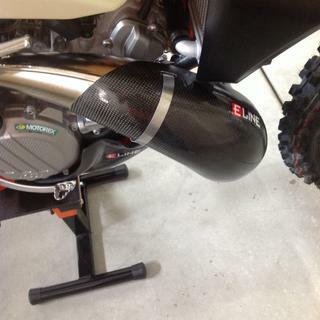 I have a 2013 sx250 with a pro circuit works pipe and this pipe guard fits. I have a fmf gnarly pipe and fits perfect. 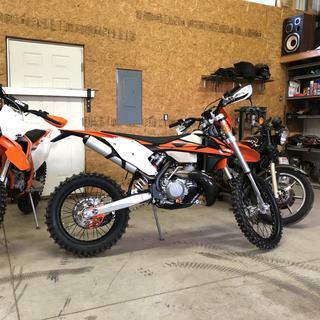 For the stock/fmf will this fit 2012 ktm 300 xc fmf gnarly? BEST ANSWER: There are two different pipe guards depending on the year your pipe was made. I believe it goes into detail on e lines website about what is what. I purchased the wrong one and it didn't fit well at all. Yes. I run a gnarly on my ‘13 250xcw. Perfect fit and VERY durable. Enjoy! Will this fit a stock 2016 yz250x header? BEST ANSWER: It probably would not fit well if at all. I would contact e-line directly and ask if they will be making one for your bike. 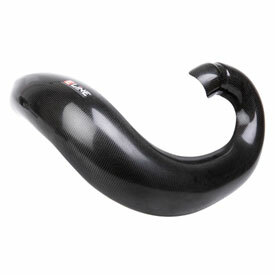 Will the E Line carbon fiber fit a 025131 FMF Gnarley Pipe for 2015 300XC-W with estart? BEST ANSWER: It should fit, it fit my 250sx with a pro circuit platinum 2 pipe. Yes if you purchase it for that model of bike.. same bend. I have a 2014 KTM 300 xcw with a pro circuit platinum 2 pipe, will this fit it? BEST ANSWER: Yes, just enter in your machine in the drop down boxes above the product image. Then in the size box below the price select your pipe. Is the 2017 Ktm 300xc pipe same as the 2016 for figment? BEST ANSWER: No. The pipes are not the same between the 2016 and 2017 models and therefore the guards are different as well. E Line actually has a new pipe guard specifically for the 2017 KTM and Husqvarna models that we will be carrying shortly.